We already know that Gears of War 3 is a damn good game. It came with an exhaustive amount of multiplayer and single-player options out of the box, and now Epic has begun to release constant downloadable upgrades, starting now and running into 2012. The first pack, called the "Horde Command Pack," offers three new maps for the game's popular Horde Mode. Two of them are brand-new, one is recycled from Gears 2. Additionally, there are four upgrades to Horde fortifications, three new multiplayer skins, and a couple of weapon skins, and it all costs 800MSP (or $10). It sound like a good chunk of content, but is it worth buying? Time for a gut-check. Kirk Hamilton, who reviewed Gears of War 3 for Kotaku and has been playing Horde Mode ever since: I pretty much play Gears of War 3 for Horde mode these days. I liked the campaign fine, and do enjoy a quick round of Beast mode from time to time. Versus multiplayer is cool but not really my thing. So it's Horde that occupies my time with the game, and Horde that will keep me playing it well into next year and beyond. Furthermore, the new maps are good stuff. Two of them—Rustlung and Azura—are new, and one, Blood Drive, is an old favorite from Gears 2. From what I've played, Azura is probably my favorite, with numerous approach points and a lot of good cover, plus some excellent scenery to go along with all the blood-spatter. It's very cool to play Blood Drive with all of the new Horde 2.0 tools, and as a result the map feels significantly different than it did in Gears 2. I will say that I hope that the Reused Map/New Map ratio stays at at least 2:1, since I already bought so many maps for Gears 2. There is, however, a complicating factor: All of those maps will be released for free in a map pack later this November. Which means that the only non-cosmetic feature that's unique to this DLC is the fortification upgrades—including a new command center allows for more powerful defenses, a silverback upgrade, and a decoy upgrade to make decoys into guard robots that do much more damage than their low-level incarnations. I haven't had a chance to use all of these yet, but I'll eventually unlock them, and more Horde upgrades are always a good thing. If you've bought the 2400MSP ($30) "season pass," then you're already getting all of this stuff anyway. And if you think the next piece of DLC sounds good (it's a 1200MSP 3-hour single player campaign called "RAAM's Shadow"), you're probably best served by going with the season pass, since the first two together will already have cost you 2000MSP, or $25. But for today, the question is: should you drop 800MSP ($10) right now on maps that will be free in a few weeks and fortification upgrades that you might not have unlocked yet? (Second update: Okay, here's the deal. 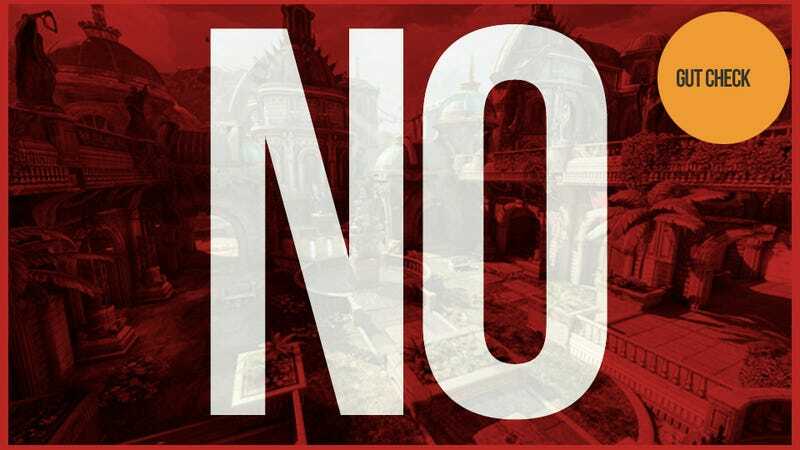 The free maps will be playable in public versus mode, but not in private matches, nor in Horde or Beast mode. Which means that if you want to play Horde on the new maps, you'll have to pay for this pack one way or another. That said, if you want it, go with the season pass, because Epic's content-gating and mode-unlocking are doubtless only going to get more confusing from here. If you're considering paying for this pack as a standalone, gut still says No. Evan Narcisse, occasional Horde Mode player and dude who was pleasantly surprised by Gears of War 3's emotional campaign ending: The big thing that strikes me about this DLC offering is that part of what you're paying for is a specialized inventory of assets. The maps you're getting in Horde Command will release to everyone in a later update, so you're only getting the advantage of a few weeks with that portion. More importantly, buyers get new fortification upgrades that non-buyers will miss out on. I haven't played Horde Mode since Gears of War 3 launched and I never got to the point where I wished I'd had improved resources. But I'm the kind of guy who'd hate to have passed up on having an advantage. I keep going back and forth as to whether Horde Command is worth ten of our American Earth monies, but considering how Activision for example will charge $15 for new maps and not much else, my vote is a very weary Yes. Stephen Totilo, who enjoys Horde mode but who apparently hasn't enjoyed it enough I love Gears of War 3's Horde mode because I love co-op gaming and tower defense. But I discovered today that I have not devoted enough time to make the Horde Command Pack worth purchasing just yet. I redeemed a freebie Season Pass code for Gears 3, downloaded Horde Command Pack and found out that I can't access the excellent new Command Center fortification. Once I can, I'll be able to summon snipers or call in shots from Hammers of Dawn. But I need to have the ability to build maxed turrets to unlock the command center, according to the Gears Wiki. I can't even build max barricades yet! Or any Silverbacks! This DLC's new weapon skins, characters and maps don't mean much to me. I want the new top-level Horde fortification upgrades and the bottom-level Command Center. Not yet, and I expect, not yet for many other people. So wait until you level up. Once you do, consider buying this at a bulk discount as part of the Season Pass, based on how good the next pack, December's campaign-lengthening Raam's Shadow plays out. No.